Obviously Brexit has taken centre stage in the UK as it was another week of drama in Westminster, with Theresa May suffering multiple defeats. However, rather than regurgitating the newsflow, it is important to put everything that has happened in context. The results of the numerous votes in Parliament were predictable given that the majority of MPs are opposed to both Theresa May’s deal and a no-deal Brexit – and we have said ad-nauseam over the past few months, Article 50 will need to be extended and our exit at the end of March will be delayed. Additionally, while MPs voted in favour of avoiding a ‘no-deal Brexit’, it doesn’t mean there won’t be a no-deal Brexit – only voting in favour of Theresa May’s agreement (which is still in play) or revoking Article 50 can do that. As for a Brexit delay, that has to be unanimously agreed by all 27 of the remaining EU members – and they have already stated they want the UK to give a clear reason why (it isn’t so the UK can continue going round in circles). Furthermore, a lengthy delay could mean that the UK has to participate in the European elections at the end of May. Interestingly, this all seems to be playing out exactly as Theresa May’s chief negotiator, Olly Robbins strategised when he was overheard by a TV reporter in a Brussels bar back in mid-February saying “got to make them believe that… extension is possible but if they don’t vote for the deal then the extension is a long one” – i.e. MPs need to either accept Theresa May’s deal at the third time of asking or face a long delay – which may mean no Brexit! 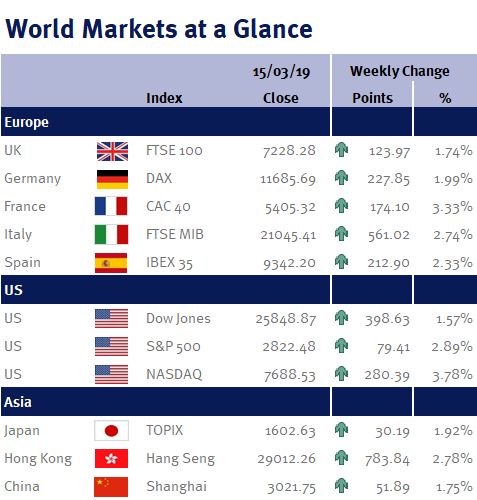 Away from all the Brexit noise, Tuesday’s (12 March 2019) US CPI inflation report was this week’s most important data release given inflation continues to undershoot the expectations of central banks around the world. The consensus forecast was for an unchanged 2.2% year-on-year rise, but thanks to lower prices for cars and prescription medicine, the core reading (which excludes food and energy) came out at 2.1% – which gives the Fed plenty of room to stick to its plan and be patient on future interest rate increases. This, coupled with solid factory orders data on Wednesday (13 March 2019), suggests our Goldilocks view (reasonable economic growth and lacklustre inflation) is still alive and well, despite all the doom-mongers in the media. Back in the UK, after a weak December (when the economy contracted by 0.4%), the UK economy rebounded strongly with UK GDP expanding by 0.5% – the biggest monthly gain since December 2016. However, these monthly figures can be volatile, especially given the current Brexit uncertainty. Additionally, the Chancellor of the Exchequer, Philip Hammond delivered his Spring Statement. Looking ahead to next week, most of the major releases are from the UK: employment data (unemployment rate and weekly earnings); CPI; and retail sales. Additionally we have BoE and Fed monetary policy meetings.